Moreton Bay is your host for this bayside triathlon. Enjoy a swim in the protected bay, a flat ride across the bridge and a run along the shore. Come along for the finisher's medal and friendly atmosphere. Join in on the fun and register for the Moreton Bay Triathlon! Enjoy a beautiful swim in the protected bay, followed by a fast ride over the Ted Smout Bridge, and a flat foreshore run. 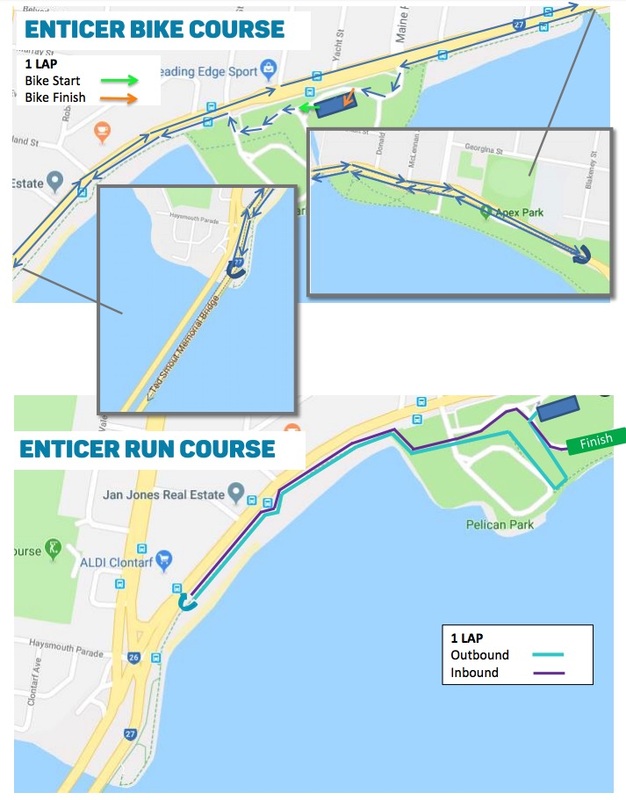 In 2019 Moreton Bay Triathlon will again be offering Olympic, Sprint, Enticer and Kids distances! *This short distance course is a crowd pleaser. Watch the sprint action on course to get pumped before your race. Bag Drop: If you have a bag & personal belongings, you need to take this out of the transition area and leave this at the bag storage area which is located in the Registration Tent from 6:30 am. A tag from your number bib will be attached to your bag so we know which bag is yours when you come back to collect this. Parking is available in Young Street, Thomas Street, Laura Street, Yacht Street, Maine Road, Thompson Crescent, but you must walk to Pelican Park. • Swimsuit / tri-suit / pink gear! Please leave all iPods and headphones at home – not only is it more fun to cheer on the ladies around you but we also have an insurance and safety requirement that you can hear event marshals and volunteers at all times. Headphones will be removed if seen. Once you receive your race number, simply save a screenshot of your race number and bring this with you on Saturday or Sunday during Event Check-In times – this number is what you need to collect all your event gear. If you haven’t received it, don’t panic, just check out the alphabetical list on the Event Information board at the event site. If you still can’t find your entry, simply pop along and see our team at the Help Desk and we’ll get this sorted for you. Transition is where you need to place your bike and change over between the swim / bike / run. Setup in Transition: find the bike rack allocated for your category, place your bike on the rack and set up your race equipment to the right (chain side) of your bike. Ensure you remove any non-race equipment away from the bike racks to the gear storage at registration (open from 6.30am in the check in tent). Familiarise Yourself: check the start & finish points to transition. 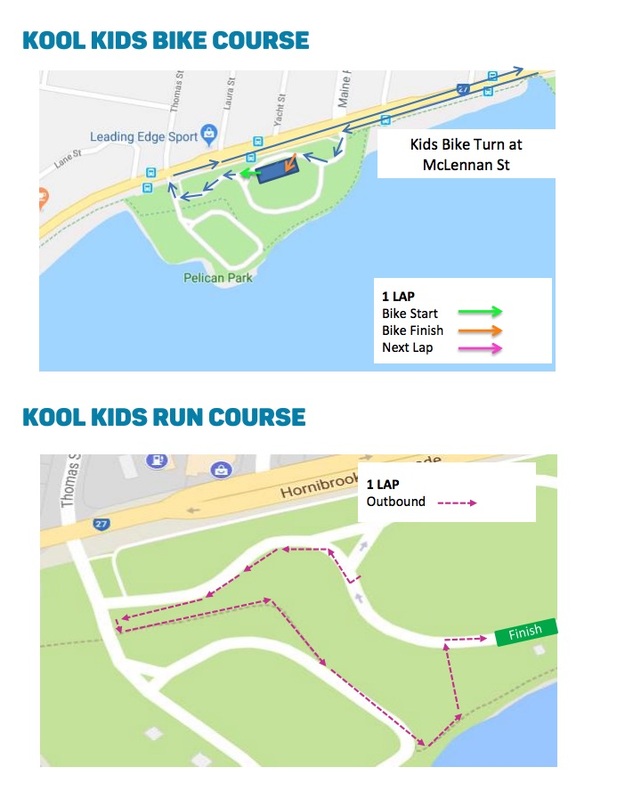 Check the course maps so you know where to go. Failure to follow direct designated course may result in personal injury or accident, you do so at your own risk and may result in disqualification. Saturday between 2:30PM and 4:30PM. Sunday between 5:15AM and 6:30AM (Sharp). Only competitors are allowed in transition area. (One parent allowed for Kool Kids during set up and pack down only. No parents are permitted in transition during the event) • Jumping any transition fences will lead to disqualification. Competitors must wait for the announcement to gain access to their bikes after their race. This announcement will be made at approximately 9.50am. 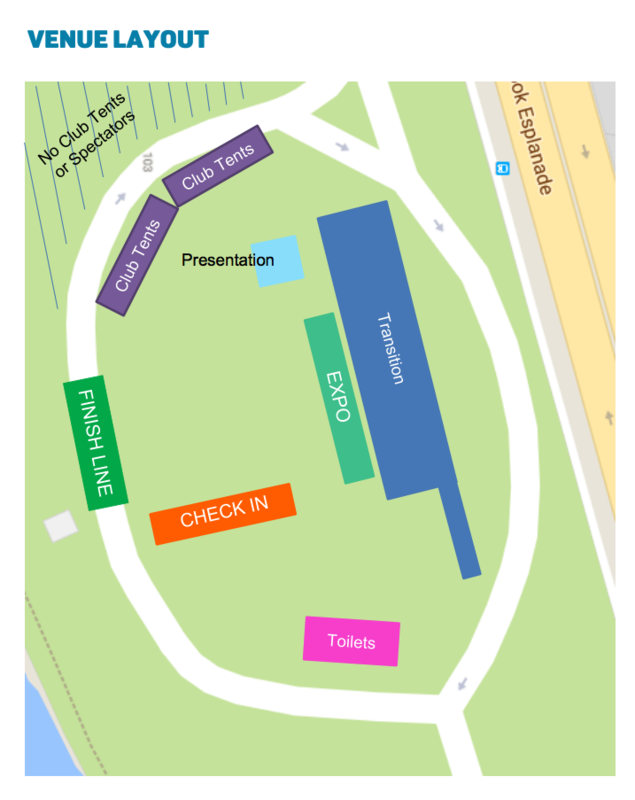 Check in is a large white marquee located inside Pelican Park. When coming to registration please have your Race Number printed out or open on your phone. The Help Desk is where you go if you would like to submit a late entry (subject to availability), change your event category or ask any last minute questions. To avoid having all the athletes entering the water at the same time, competitors are divided into “waves”. 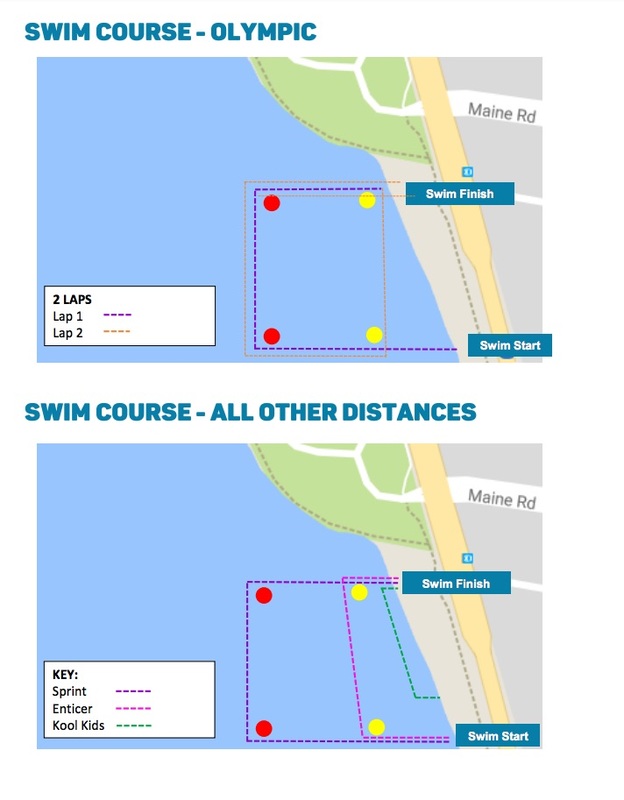 Each wave will consist of no more than 100 swimmers to give you plenty of room to swim and enter transition smoothly. Check the information board for your swim start time or view them on the website in the week leading up to your race. Note that tentative category start times are listed but MAY CHANGE the week of the race. Specific wave starts are listed on the website Thursday of race week. You are not permitted to race with any music devices including mobile phones, MP3 players, earphones etc, this is a very serious safety risk to you. As stated in Triathlon Australia’s rules and regulations, if you are caught with any of these items, you may be instantly disqualified. I had a wonderful experience at Moreton Bay doing my first ever triathlon, the Olympic Distance. The support crew were amazing, especially when I found myself coming last! I was encouraged, supported and helped along the way and I was never left alone at the end. I did however end up in hospital 8 hours later, with hyponatremia, due to not realising how important it was to replace the sodium I had lost through sweating. I also drank too much water afterwards, which made things worse as it flushed more of the sodium out! So my advice to anyone else considering doing an Olympic Distance Triathlon for the first time is to see a sports dietician and get the right advice re: hydration and recovery. I also think that this is something that could be addressed by the event crew, prior to the event, to make first time competitors more aware of the dangers involved in drinking too much water afterwards and the importance of sodium replacement and where to get advice on how to do this properly. Other than my rather difficult recovery, I enjoyed the atmosphere of the event and although I came 2nd last I was made to feel like a champion, and for that I am incredibly thankful. 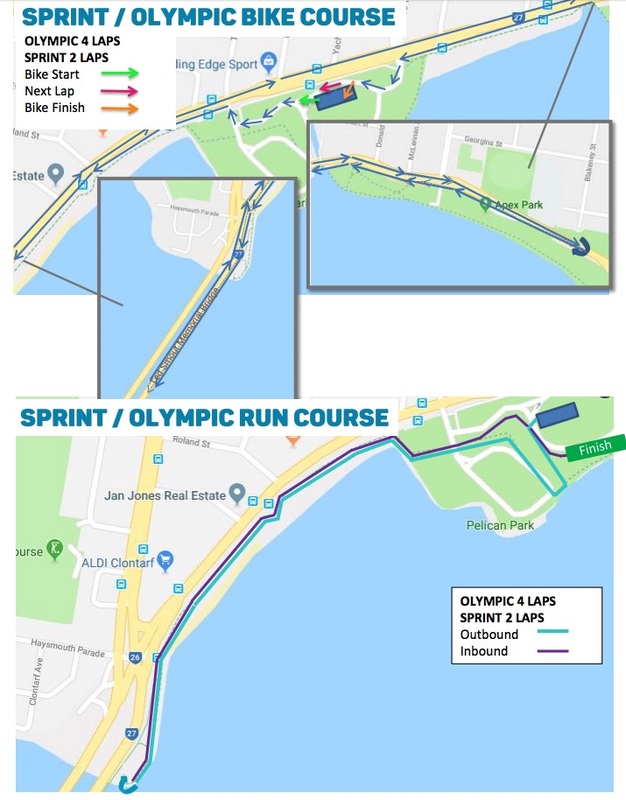 Whether youre an experienced marathon campaigner or simply a parent searching for a more active family outing, the 7 News Gold Coast Running Festival will have something for you, featuring a Half Marathon as well as 10 km, 5 km, 2.5 km, and 1 km races. Come on down and bring your friends!